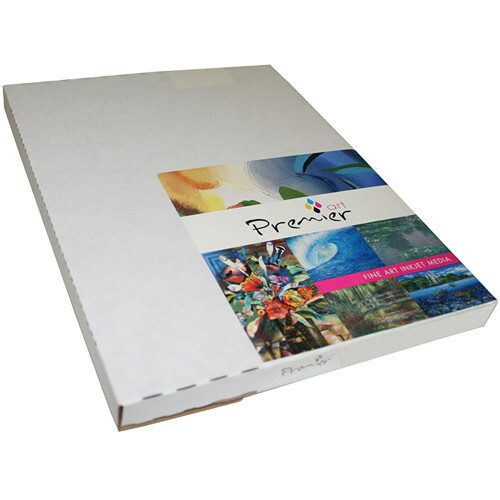 With a 100% cotton rag base made from a hot press mould, this 50-sheet pack of 8.5 x 11" Smooth Fine Art Paper from Premier Imaging offers photographers and artists a smooth matte surface with a high resolution coating that provides a high D-max and wide color gamut. The 205 gsm paper is naturally white with no optical brightening agents, is acid- and lignin-free in its construction, and is alkaline buffered to increase longevity. Also, it has a thickness of 12 mil and is double-sided. Finally, the medium dries nearly instantly and is water-resistant. Box Dimensions (LxWxH) 11.3 x 8.8 x 1.0"